Summary: Three cases of spontaneously closing dural arteriovenous fistulas (AVFs) are presented, and 11 previously published cases are reviewed. On the basis of clinical and angiographic data, two types of spontaneously regressing dural AVFs are distinguished: posttraumatic and spontaneous. In all cases, the explanation for spontaneous closure is unknown. Some authors have hypothesized that the thrombosis of the draining sinus could be involved. We report three cases of spontaneous dural AVF closure with conservation of sinus patency. Spontaneous closures of dural arteriovenous fistulas (AVFs) are rare and have been scarcely reported (1–9). The mechanism of these occlusions is unknown. Some authors have reported that the thrombosis of the draining vein or sinus could trigger the secondary closure of the dural AVF. We report three cases of angiographically proven spontaneous regressions of dural AVFs without occlusion of the affected sinus. After reviewing both our personal cases and others from the literature, we suggest that two types of spontaneously regressing dural AVFs must be distinguished: posttraumatic and spontaneous. A 42-year-old man was initially referred to our unit in June 1984 reporting right-sided pulsatile tinnitus, progressively increasing over a 1-year period. The patient had a personal and family history of migraine. Physical examination revealed an isolated right-sided mastoid bruit. Selective cerebral arteriography was obtained, disclosing a torcular dural AVF. This dural AVF displayed bilateral arterial supply from both external carotid arteries (Table, Fig 1A). Venous drainage was achieved through the left transverse sinus along an anterograde direction without cortical drainage (Fig 1B). The dural AVF was classified as type I according to the referring classification (10, 11), which accounts for a benign lesion. Because the tinnitus was well tolerated by the patient, no specific treatment was conducted. A, March 1996 angiogram. Injection of the right external carotid artery in lateral view shows the torcular dural AVF fed mainly by the occipital artery. B, Same injection on anteroposterior view showing the dural AVF drainage through the left transverse sinus. C, T2–weighted MR imaging at 2600/80/2 (TR/TE/excitations) performed during the same period showing torcular dilatation. Ten years later, the patient reported bilateral pulsatile tinnitus and was referred to our unit for a control angiogram. Selective cerebral angiography performed in March 1996 showed identical findings compared with those from prior examinations. Cerebral MR imaging showed an isolated enlarged torcular region (Fig 1C). There was no argument suggestive of associated sinus thrombosis. No explanation could be given for the appearance of a controlateral tinnitus without change of the venous drainage. Two years later, in 1998, the patient noted a sudden disappearance of the tinnitus without any other contemporary symptoms but did not consult our unit. In November 1999, two episodes of unusual headaches led the patient to seek medical advice. Physical examination findings were normal, and the audible bruit previously reported was absent. Selective cerebral angiography confirmed the disappearance of the previously reported dural AVF (Fig 1D and E). Cerebral venous drainage was achieved via both the right and left transverse sinuses. Results of cerebral MR imaging performed at the same time were considered normal, with a significant decrease in size of the torcular region (Fig 1F). The headaches were attributed to the patient's history of migraine. A 57-year-old woman was referred to our unit in March 1974 and reported right-sided pulsatile tinnitus. Selective cerebral angiography disclosed a dural AVF draining via the right transverse sinus in an anterograde flow with arterial feeders from both the external carotid artery and the vertebral artery. Two successive selective endovascular arterial embolizations of this type I dural AVF were performed, as the patient did not tolerate her disabling tinnitus. Postembolization control angiographies showed the persistence of a reduced arterial flow mainly via the vertebral branches. The patient was discharged from our unit without further treatment. In November 1985, although physical examination showed the persistence of an audible bruit, a control angiogram disclosed a persistent dural AVF with both external carotid artery and vertebral supplies. A control angiogram was obtained in April 1991, and it showed no change concerning the angioarchitecture of the dural AVF; the clinical examination remained unchanged. In December 1991, the patient experienced the sudden disappearance of her tinnitus but did not inform her referring physician. In December 1994, she reported mild bilateral frontal headache, without recurrence of her tinnitus. A control angiogram was performed, which confirmed the total and spontaneous closure of the previously described dural AVF. Both transverse sinuses were patent, with no irregularity of the sinus wall. The patient was discharged with no further treatment. A 28- year-old man was admitted to our hospital in July 1992 for head injury consecutive to a car crash. Initial head CT confirmed facial trauma with pneumocephalus and right frontonasal hematoma. The patient's condition improved rapidly, and he was discharged from the hospital. By December 1992, however, the patient had a left-sided exophthalmos develop. A posttraumatic carotid-cavernous fistula was diagnosed and treated by endovascular embolization. In addition, a left-sided superior petrosal sinus dural AVF was incidentally disclosed. The only arterial supply came from the posterior meningo-hypophyseal branch of the left internal carotid artery. The transverse sinus was not visualized during the late venous phase (Fig 2A and B). Because the patient was asymptomatic and because the hemorrhagic risk of such type I dural AVFs is nil (10, 11), no further therapy was conducted. A systematic control angiogram obtained in December 1993 showed the closure of the left-sided dural AVF. The patient recollected no particular clinical symptom that could have been related to the spontaneous occlusion of the dural AVF. Spontaneous closures of dural AVFs are rare. In addition to our 3 patients, we reviewed 11 cases from the literature (1–9). All cases are summarized in the Table. From our review of both clinical and angiographic findings, we suggest that two types of spontaneously regressing dural AVFs must be distinguished: posttraumatic and spontaneous. We believe that our case 3 and four additional literature cases can be included in the posttraumatic dural AVF group. Although the direct link between trauma and dural AVF development is impossible to demonstrate, some findings seem specific to that group. 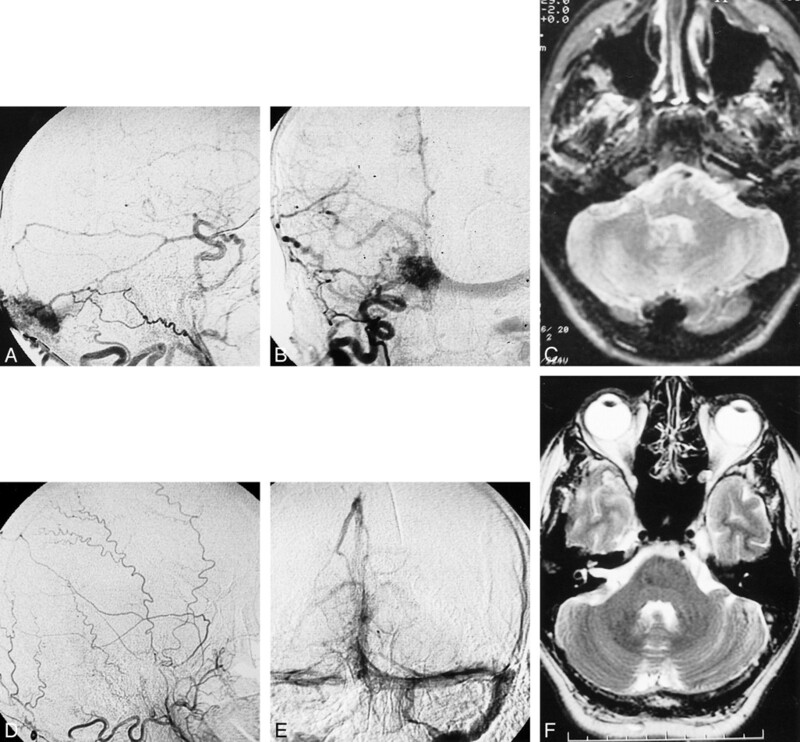 Indeed, for all of these patients, diagnosis was performed after a major head trauma and dural AVFs involved atypical arteries and draining veins or sinuses. For instance, in both case 3 and the patient reported by Olutola et al (5), the dural AVFs drained through the superior petrosal sinus and veins of the pterygoid plexus region, respectively. These structures are infrequently involved in standard dural AVFs (12). In both cases, the dural AVFs were fed by either a single or few arteries, with single or at most few arteriovenous shunts. Moreover, a skull fracture involving the precise region of the dural AVF was reported by Olutola et al (5). In one of the 3 patients with a history of head trauma reported by Chaudhary et al (4), findings from a cerebral angiogram prior to the trauma were normal. The incidence of such posttraumatic dural AVFs is unknown. Most of them probably remain undiagnosed when involving draining structures other than the lateral or cavernous sinuses. Indeed, as they remain clinically silent, cerebral angiographies are not performed. We thus believe that the rate of spontaneously closing posttraumatic dural AVFs could be underestimated, as such lesions could spontaneously regress without notice. Spontaneous closure in posttraumatic dural AVFs could be explained by both the angiographic characteristics of the dural AVFs and the etiology itself. Indeed, we suspect that a single and small AVF as displayed in some posttraumatic dural AVFs is probably more likely to occlude spontaneously than a dural AVF with multiple and disseminated feeders. This mechanism was first suggested in spontaneously closed cerebral arteriovenous malformations (13, 16). Furthermore, posttraumatic vessel damage could have a tendency to develop scar tissue during the healing process, especially if the arteriovenous connections resulting from trauma are small and rare, thus leading to secondary occlusion of the posttraumatic dural AVF itself. Cases 1 and 2, as well as the remaining literature patients, can be included in the spontaneous dural AVF group. All such patients had an unremarkable medical history prior to diagnosis. Furthermore, the dural AVFs were located on sinuses usually involved such as the lateral, the torcular, or the superior sagittal sinuses. Moreover, the arteriovenous shunts were numerous and fed by multiples arteries. The clinical presentations of the dural AVFs were concordant with our dural AVF classification (11). Type I dural AVFs were revealed by isolated pulsatile tinnitus and bruit as in our two patients and in four literature cases (1, 2, 7, 8). All type III dural AVFs (fistulas with cortical drainage) were diagnosed after cerebral hemorrhage. The mean interval between dural AVF diagnosis and spontaneous closure was 18 months in the literature patients and 213 months in our two patients, which, to our knowledge, is the longest delay reported. Two mechanisms of spontaneous closure have been discussed throughout the literature for this group of patients: sinus thrombosis and intracranial hemorrhage. The influence of sinus thrombosis on spontaneous dural AVF closure was supported by angiographic findings in three patients from the literature (1, 4, 8). Such findings were not identified in other reported cases. Moreover, in all of our patients, the sinus drainage was improved after the spontaneous occlusion of the dural AVFs. When questioned about the symptoms the patients recollected to be contemporary to tinnitus disappearance, none of our patients reported any specific sign, like acute cephalalgia or focal neurologic impairment, as opposed to previously reported cases where sinus thrombosis was reported. The second mechanism related the spontaneous dural AVF closure to possible intracranial hemorrhage. Olutola et al further suggested that spontaneous dural AVF closure could be compared with the spontaneous closure of cerebral arteriovenous malformations (13–16). Indeed, some authors have claimed hemorrhage could trigger the closure of intracranial arteriovenous malformations (14, 16), whether linked to hematoma-mediated mass effect or to the secondary vasospasm of the feeding vessels. Several objections can, however, be issued concerning the possible influence of intracranial hemorrhage on dural AVF closure. First, all spontaneously occluded type I dural AVFs were hemorrhage free. Second, hematoma sometimes preceded the diagnosis of dural AVF and, therefore, could not be responsible for its disappearance. Finally, most feeding arteries of dural AVFs are extradural and, thus, cannot develop vasospasm even in the presence of subarachnoid hemorrhage. In cases 1 and 2, neither sinus thrombosis nor intracranial hemorrhage can thus account for spontaneous dural AVF closure. We believe that this spontaneous closure could be explained by the intrinsic compression of the arteriovenous shunts within the sinus wall. To our knowledge, no explanation has yet been issued concerning this phenomenon. Neither of case 1 and 2 showed coagulation disorders during hospital follow-up. Changes affecting the structure or conformation of the sinus wall could, however, be involved. A focal increase in sinus size could lead to focal compression of the arteriovenous shunts within the wall itself, thus leading to the final occlusion of the dural AVF. The initial cause of the structural or conformational changes affecting the sinus remains uncertain. Similarly, because cases are rare, we are unable to identify patients' characteristics predisposing them to spontaneous dural AVF closure. Finally, the fact that sinus patency was improved in all of our patients, even a long time after initial dural AVF diagnosis, supports the idea that any treatment performed for type I dural AVF must be carried out to keep the draining sinus patent. The sacrifice of the draining sinus must be limited to patients with clinically unbearable symptoms (tinnitus, bruit) unresponsive to successive arterial embolizations. Spontaneous closures of dural AVFs are rare. Most of these spontaneously resolving lesions are type I dural AVFs. The sudden disappearance of a previously known tinnitus is the usual clinical presentation. Posttraumatic dural AVFs, because of their specific clinical presentation and possibly atypical angiographic findings, must be distinguished from other dural AVFs. Because their incidence could be underestimated, the evolution of these specific lesions is unknown. The mechanisms accounting for all dural AVF regressions remain unclear. A direct occlusion of the intradural shunts, rather than dural sinus thrombosis, could be responsible for this process in some cases. Because the spontaneous closure of the dural AVFs can occur with conservation of the draining sinus's patency, the sacrifice of the sinus in type I dural AVFs must be limited to patients with clinically disabling symptoms unresponsive to arterial embolizations. ↵1 Address reprint requests to Emmanuel Houdart, Service de Neuroradiologie, Hôpital Lariboisière, 2 rue Ambroise Paré, 75475 Paris Cedex 10 France.